Nicole's Needlework: Warning - Very long post! Crescent Colours Wild Berries and Weeping Willow. And to really make sure I really liked them I stitched a little bit on the linen I was going to use, which I dyed with a little bit of tan Rit Dye just to give it an antique appearance. I got the newest Lizzie Kate Giggle Boxer, which is totally me (it says "Did you ever stop to think, and forget to start again?") and the newest Sea to Shining Sea "Midwest" thread pack. Last but not least I had a package waiting for me on Saturday. It's a scrap caddy that I ordered from this Etsy Shop. I originally saw it on Danielle's blog and thought it was so cute! WOW, Good luck with Quaker Virtues. I love the threads you picked out and the fabric you dyed turned out great too. Your LHN piece looks great too. Thanks for the link to the Etsy shop. I'm going there now. Very pretty colors for the quaker virtues! How big is your piece of fabric? I know my mom had to use a fat half! Out of curiosity...what is the white background that you use in your pics? Quaker Virtues looks great, and I love the colors that you chose! Sea to Shining Sea is looking great, too! 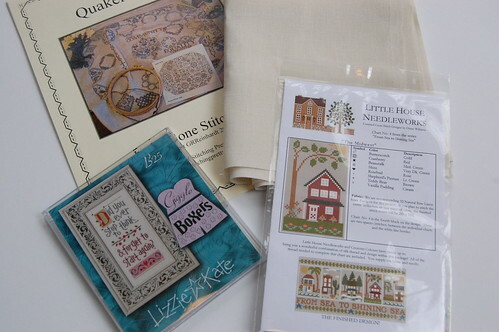 QV will be gorgeous with your fabric and floss choices! Love your LHN too~~it's looking great! Quaker Virtues is going to be gorgeous!!!! You chose wonderful floss & fabric!!!! The LHN looks great as well. I love the fabric choice. I will have to look back & see if I see what it is. I am 'collecting' the charts, for future use!! 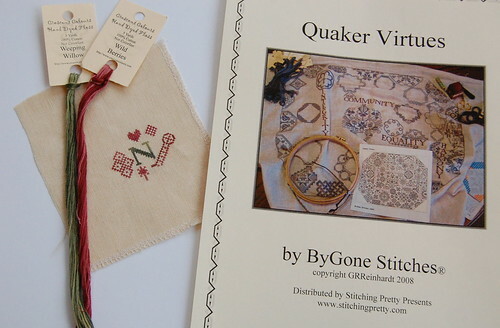 Quaker Virtues looks great and I love your blog! Oh Nicole, QV going to be TERRIFIC! Love your color choices. Your choices for QV look great. And your thread catcher is fantastic! What great fabric! I hope I have brought that person lots of business for them. Hi Nicole: I am so glad that you had a good time at Amy's! Your stash is gorgeous and I love the colors that you have selected. I ordered midwest block for sea to shining sea from Amy on Friday. I did finally get SB Family Sampler but I had to end up going up to 38.00 since a lady tried to outbid me but I am so glad that I got it. Yours is really pretty! I hope to get some stitching done today. Wow, beautiful start on Quaker Virtues. 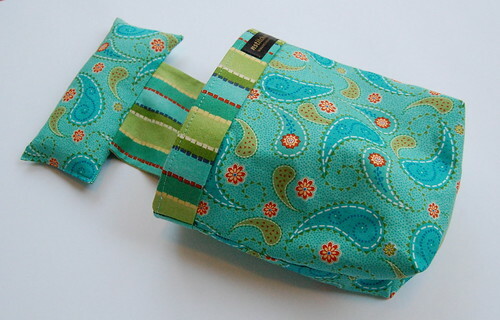 I have admired this pattern for awhile, and I love your color choices. Love your floss colours and the fabric you dyed in readiness for Quaker Virtues. Can't wait to see WIP! I love it!! They are made so well!! Looks like there is goinf to be more wonderful finishes coming soon!! The colors will look great for your Quaker Virtues! I'm looking forward to see the progress of it. Also the "sea to shining" one is really great! 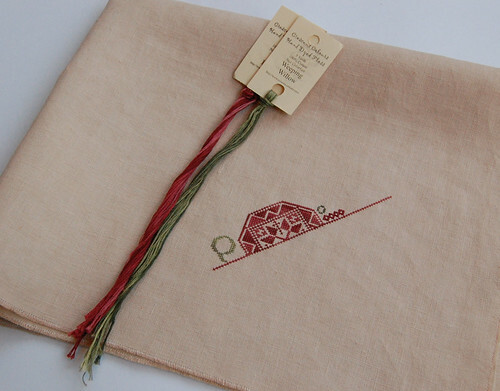 Have lots of stitching fun. Those are lovely colours you've chosen for Quaker Virtues. Diane's moms is gorgeous! ooohhh, I love those 2 colors together; that's going to be so pretty. 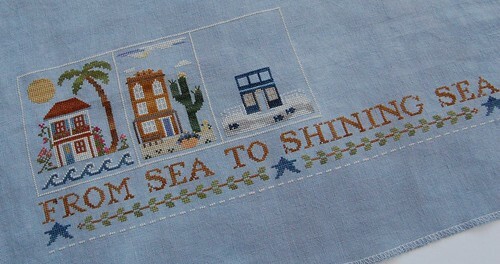 I want to stitch "sea to shining sea" also; I LOVE That pattern!!! Quaker Virtues is such a beautiful piece. I love the colours you have chosen, they go together so beautifully. 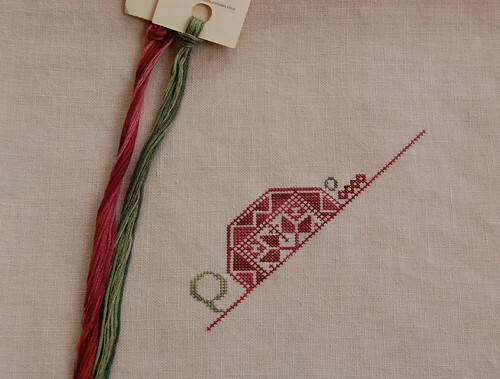 Your stitching is great and so inspirational, thank you. Both of your pieces look great. I am looking forward to seeing more of Quaker Virtues. You picked such lovely colors. Les couleurs du premier ouvrage sont fantastiques ! Il est très prometteur !!! You have an award, please visit my blog to see it. Hi Nicole, thanks for visiting my blog and leaving me such sweet comments. I have to confess that I read your blog all the time. You are an amazing stitcher. Great choice of colors (my two favorite) for Quaker Virtues. Can't wait to see your progress. Nicole, you have such a talent for selecting fabrics and floss colors. Your choices for Quaker Virtues are beautiful. It's going to be gorgeous! Your Sea to Shining Sea is perfect on your blue fabric too. Love your threads and fabric! Can't wait to see it come to life!